With the Thai elections coming up here is my contribution to its coverage which focuses on the Commoners Party, who are by far one of the most interesting of all the parties to register. They may be tiny in comparison with just over 1000 members, only officially formed in 2018 and lack the budgets of other parties (they even made their own political banners) but the party is many years in the making, growing from a grassroots movement, offering an alternative to the typical populist hierarchical politics common in Thailand. 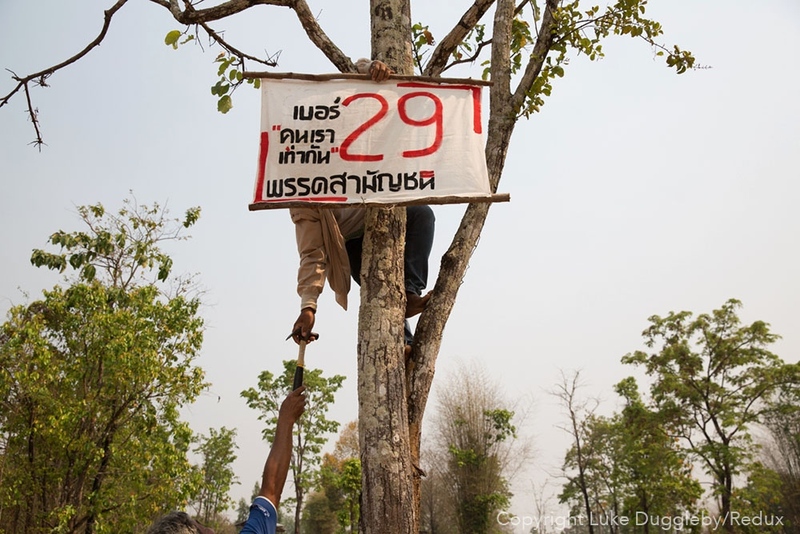 In this photograph taken in a remote district of Sakhon Nakhon Province in Northeast Thailand, Commoners Party members nail the party's handmade banners to a tree. Formed by a group of activists, NGO workers and members of community environmental groups largely from rural Thailand, the Commoners Party sets out to be governed by the working poor with its members from communities across the country largely deciding the policies it will align itself with. Decentralisation of power, the supporting of human rights and equality, and social and ecological justice features highly on the party’s policy list. Even its elected chief, a man called Lertsak Kamkongsak, has spent the last 20 years supporting communities around the country who fight against issues related to mining operations and the negative impacts they cause.